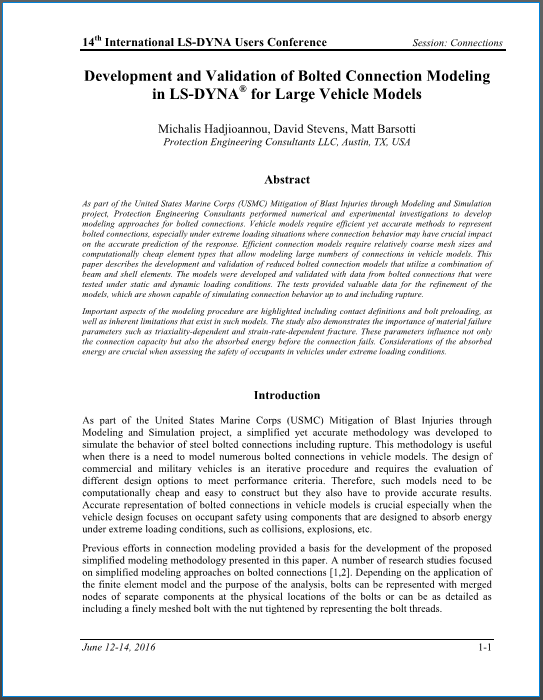 As part of the United States Marine Corps (USMC) Mitigation of Blast Injuries through Modeling and Simulation project, Protection Engineering Consultants performed numerical and experimental investigations to develop modeling approaches for bolted connections. Vehicle models require efficient yet accurate methods to represent bolted connections, especially under extreme loading situations where connection behavior may have crucial impact on the accurate prediction of the response. Efficient connection models require relatively coarse mesh sizes and computationally cheap element types that allow modeling large numbers of connections in vehicle models. This paper describes the development and validation of reduced bolted connection models that utilize a combination of beam and shell elements. The models were developed and validated with data from bolted connections that were tested under static and dynamic loading conditions. The tests provided valuable data for the refinement of the models, which are shown capable of simulating connection behavior up to and including rupture. Important aspects of the modeling procedure are highlighted including contact definitions and bolt preloading, as well as inherent limitations that exist in such models. The study also demonstrates the importance of material failure parameters such as triaxiality-dependent and strain-rate-dependent fracture. These parameters influence not only the connection capacity but also the absorbed energy before the connection fails. Considerations of the absorbed energy are crucial when assessing the safety of occupants in vehicles under extreme loading conditions. Read the PEC Publication by Dr. Michalis Hadijioannou, Dr. David Stevens, P.E. and Matt Barsotti.